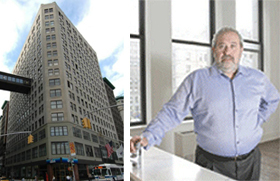 Developer Yitzchak Tessler is facing multiple challenges in his effort to hold on to the condominium conversion project at the former Toy Building at 1107 Broadway overlooking Madison Square Park. The bankrupt lender Lehman Brothers Holdings sued Tessler and his company 1107 Broadway LLC yesterday to foreclose on a $136.8 million senior loan. In addition, the Lehman Brothers’ suit, filed in New York State Supreme Court, seeks to enforce what it said were Tessler’s personal guarantees made to secure the loan. contractors, at Broadway and 24th Street, over the past two years as the redevelopment conversion began. Tessler, CEO and president of Tessler Developments, is one of the city’s high-profile private developers, specializing in converting commercial properties to residential, such as 240 Park Avenue South in Flatiron and the Textile Building at 66 Leonard Street in Tribeca. According to the lawsuit, Lehman Brothers provided 1107 Broadway LLC with the $136.8 million loan to finance the purchase of the property. Tessler bought the property in October 2007 from investors led by the Chetrit Group for $235 million. Although Lehman provided additional financing at the time, the bank did not foreclose on three other Tessler development-related loans on the property, the suit says. Shortly after closing on the purchase, Tessler announced plans to convert the 16-story office building into 165 luxury condo units. In October 2008, the loan became due, but Tessler did not refinance the project, the suit says. In December that year, Lehman Brothers sent him the first of four letters telling him that the failure to repay the loan signaled a default, the court papers say. And that same month, he announced he would add another eight floors to the building. The conversion project is stalled and in December 2009 Real Capital Analytics added the building to its “troubled asset” report. The attorneys representing Lehman Brothers declined to comment. A phone call and e-mail sent to Tessler Developments were not returned.